56 3/4 by 43 3/4 in. ...the green light subtly reflected on Cécile’s skin, as well as her attitude, with her eyes staring at the viewer, are reminiscent of Matisse’s own explorations with color and composition. Draftsman, photographer, painter, writer, art dealer and collector, Walter Bondy epitomizes the multifaceted artists of the turn of the 20th century. Bondy began his career as a fashionable portrait artist. It was in Paris that he developed his unique artistic voice and personality. In the French capital, he became influenced by Renoir and his use of colors and by Maurice Utrillo, because “we see Paris through his eyes”, as Bondy once observed. Over the first decade of the 20th century, Bondy played an active role in the dômier circle and more widely in the Parisian art scene, exhibiting at the Salon des Indépendants and the Salon d’Automne. La Pédicure, an intimate portrait of the artist’s wife-to-be, Cécile Houdy, quintessentially embodies the power exerted on Bondy by the French capital. It also reveals the influence of the groundbreaking 1905 Salon d’Automne exhibition, where the boldly colored canvases of the Fauves—Henri Matisse, André Derain, Kees van Dongen and Maurice de Vlaminck—received public acclaim. La Pédicure echoes in particular Woman with the Green Stripe and Woman with the Hat, portraits Matisse made of his wife for this exhibition. As Kenneth Silver writes, “before 1910 the influence of Matisse was far and away the strongest of that of any living master on the Dômiers” (Kenneth Silver and Romy Golan, Jewish Artists in Paris, the Circle in Montparnasse, 1905-1945, New York, 1985, p. 16). 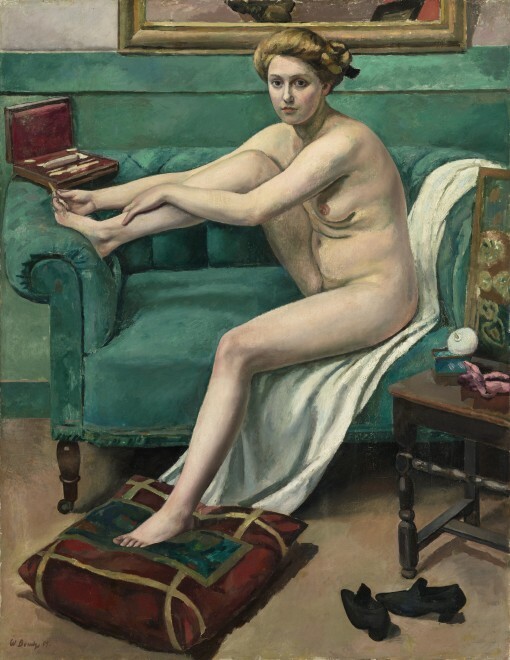 Indeed, the green light subtly reflected on Cécile’s skin, as well as her attitude, with her eyes staring at the viewer, are reminiscent of Matisse’s own explorations with color and composition.